When the likes of Prada and Victoria Beckham championed corsets on the runway last season, we suspected it would be one of those trends that would remain firmly in the fashion week bubble and never be worn in real life. Then a number of street style stars, including Taylor Tomasi Hill and Margaret Zhang, got behind the trend and started layering them over white shirts. We began to (slowly) change our minds. Fast-forward six months, and in that time they have been worn by Gigi Hadid, Kim Kardashian West and VB, and the entire of the Who What Wear UK team is set to add one of Zara's just-in corset belts into our shopping baskets. 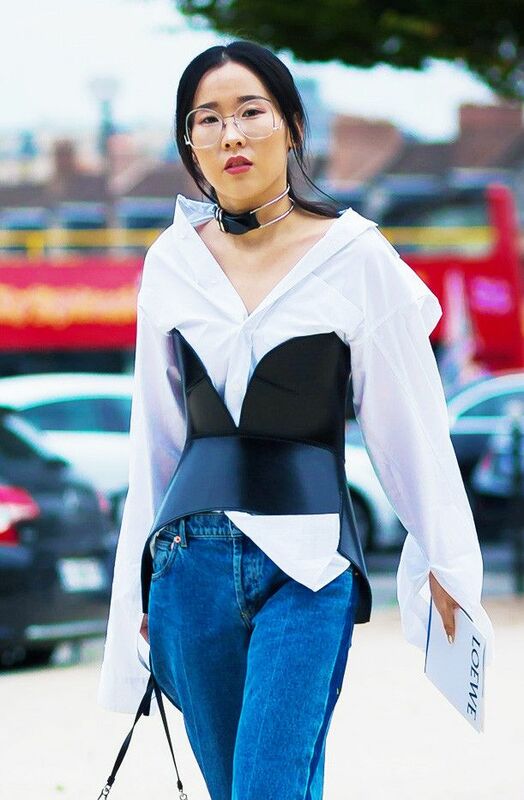 What's more, we are certain that you can wear these corset belts outside of the fashion week circus and it won't end up in an "oops purchase" drawer. Prada's corset belt sold out almost instantly when it dropped on Net-a-Porter last autumn—and it wasn't exactly a fast-fashion fix but a firm designer investment. Corset belts are at the heart of Zara's new collection, with three styles in black leather and canvas that would look great paired over an oversize shirt with jeans. Tempted to try a corset belt? Scroll through the gallery below to see our edit of the best. Still not convinced? Find out what happened when our editorial director, Hannah Almassi, spent a week wearing a corset belt.